Kindly do this asap so that i can get payment done as soon as i read back from you via PayPal, and if you do not have a PayPal Account you could register on their website or kindly provide me with your Banking details so that when i get the payment done it would be credited into your Bank Account.Hope to read from you in the morning. I would offer to activate the BoB Credit Card payment facility for them to make the payment. That's what I do for my overseas sales - and it works like a charm! Thanks, i think BOB will do the rest. I think the poor English is reason for suspicion and if your buyer has no previous ratings , definite reason to be cautious . I would email the client back requesting that they complete the purchase order and payment as per the terms of the listing and see where your request leads but I think MsPlod's link sums it all up . Hello thanks for the mail am glad you called your Bank and got back to me, i would want you to please check for the shipment cost from your side to his location which i gave you in my first mail in the United States Of America, so i can be sure i am paying the right shipment cost to avoid loss on your side, Just get to the South Africa postal Service office (SAPO) and make inquiry of shipment cost via EMS postal service to be sure asap you get this done kindly provide me with the cost and also Your bank Account details so that i can get the payment done asap. Hope to read back from you asap and thanks for your time. Got a mail back from buyer stating that money have been paid. 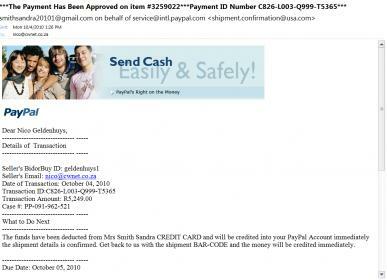 Also recieved emails that look just like paypal but it was send from the buyers email address on behalf off PayPal. Its unbelievible what these people will do. All I can say to all BOB users, make SURE all money cleared in your account before sending anything to buyers. LoL so funny this! Definitely a scam.